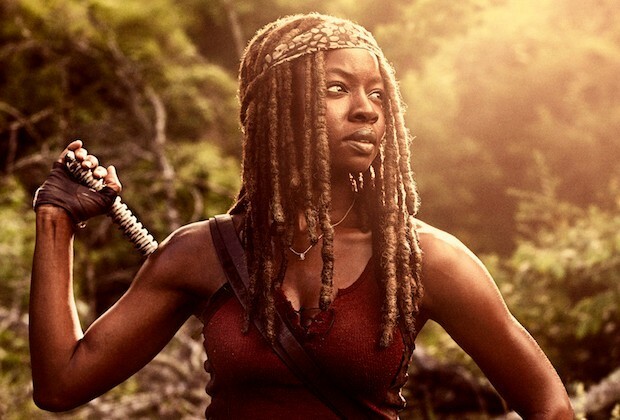 We wish we weren’t reporting this, but THR broke the news this morning that Danai Gurira’s latest contract with The Walking Dead lays the groundwork for her transition out of the series. “Under her new deal, Gurira will return in a limited capacity — described as only a handful of episodes — that will be interspersed throughout season 10,” the site reported. Neither the actress nor the show staff have commented on the news as of yet. It’s another huge blow to a show that can’t take any more abrupt departures, especially of beloved characters. AMC can pretend all they want that The Walking Dead is like Fame (it’s gonna liiiiiive forevah), but it doesn’t change the reality that the cast list is leaking like a sieve, everyone’s noticing, and it doesn’t make them look good. So what now — how does Michonne leave the show? Does Jadis show up in her helicopter and take her away? That was sarcasm but….maybe? THR says “The actress, playwright and social activist will then likely segue to the three Walking Dead movies that AMC is planning with former leading man Andrew Lincoln.” Upon this point, she will be replaced in the original series by a pint-size, six-year-old Michonne Jr. wielding a plastic katana. One big question unanswered in the report is….who is going to take care of her kids? Maybe Maggie—no, wait. How about Jesus—no, not him either. Daryl? Reedus or no, his character would simply refuse. Eugene? The KIDS would refuse. Guess those orphans are on their own.